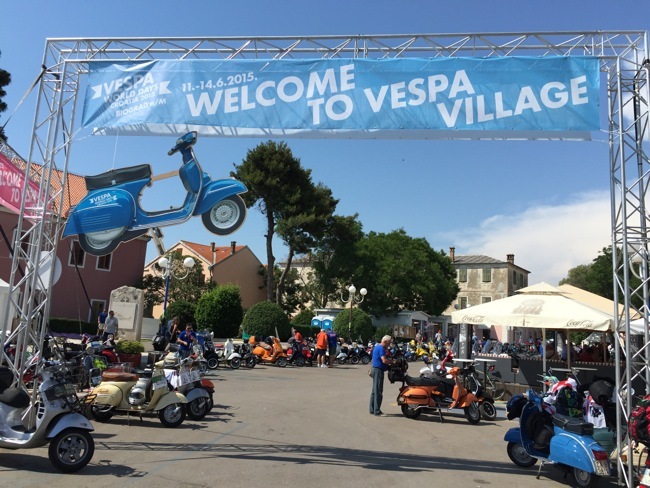 At Biograd, Croatia, the 2015 edition of Vespa World Days and also the most important international rally dedicated to the most beloved two-wheeler in the world, has come to an end. 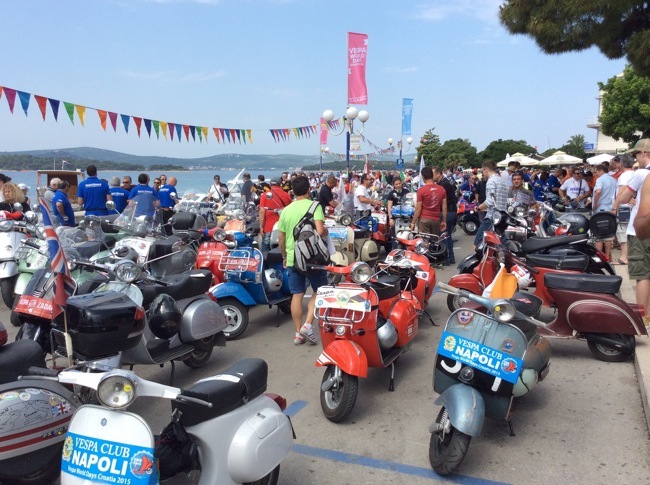 Thursday, 11 June to Sunday, 14 June, were four days of friendship and love for the adventure and voyage that brought more than 5,000 Vespas from 32 different countries to gather along the Croatian coast. Besides Europe (which was fully represented), there were participants from Brazil, Canada, Israel, Mexico, Taiwan and Thailand. 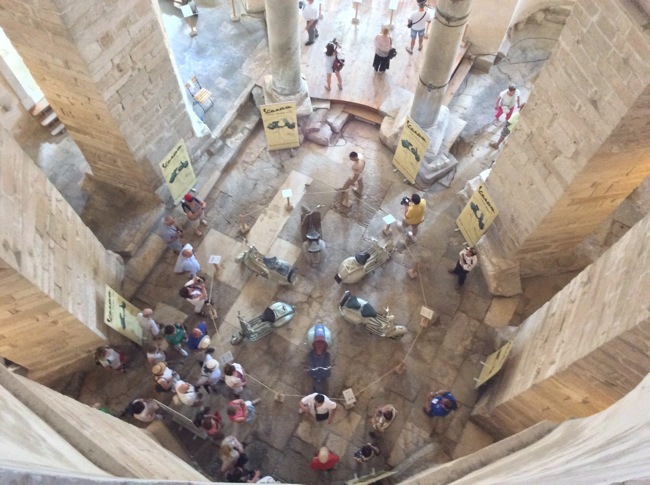 The presence of representatives from countries in the former Yugoslavia was significant; naturally from Croatia (host country), but also from Bosnia, Kosovo, Macedonia, Montenegro, Serbia and Slovenia. 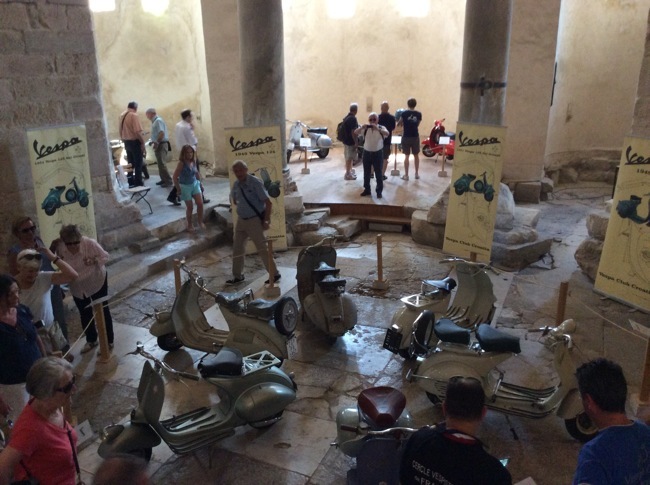 Once again, Vespa proved to be a bridge of friendship between different populations and generations. The over-5,000 Vespas included both historic and more recent models. Some of the most admired participants were a rare very first edition Vespa (the 98cc from 1946), the powerful GS from 1955 and the sporty Vespa SS, a legend for young people in the 1960s. The line-up of the new Primavera, Sprint and GTS units was impressive, successfully perpetuating the message of a unique heritage. Following the tradition, Vespa World Days concluded with the Vespa Club awards. It was an Italian triumph with Martin Shift, President of the Vespa World Club (the organisation that assembled 56 national Vespa Clubs) who presented the Vespa Trophy to the Sirmione Vespa Club, a team made up of 12 Vespas that arrived at Biograd after visiting the most number of checkpoints throughout Europe. The all-Italian podium saw the Cerignola Vespa Club in second place and the third spot was taken up by the Veronese VR37100 Vespa Club which took this award and this being their very first time participating. The individual Vespisti awarded were Canadian Jeff Schneider, Russian Alexei Kozlov and Serbian Dejan Stojcic. Now, the baton will be passed to the Vespa Club de France which will organise Vespa World Days 2016 in the spectacular setting of Cote d'Azur at Saint Tropez. With more than 18 million units produced since the first one in 1946, Vespa gave the whole world an extra gear, spreading throughout the streets of every continent. The first truly global transportation brand, Vespa became a trait d'union t (common link) between generations, interacting with social environments which were far apart from one another, creating various cultural phenomena, particular to the situations in which it artfully integrated into, until it became a protagonist and a distinctive trait. It led fashion, music and youth revolutions. It accompanied nations in their growth. It gave them brilliance in times of economic wellbeing. And, today it is one of the most common and well-known Italian products in every corner of the globe. 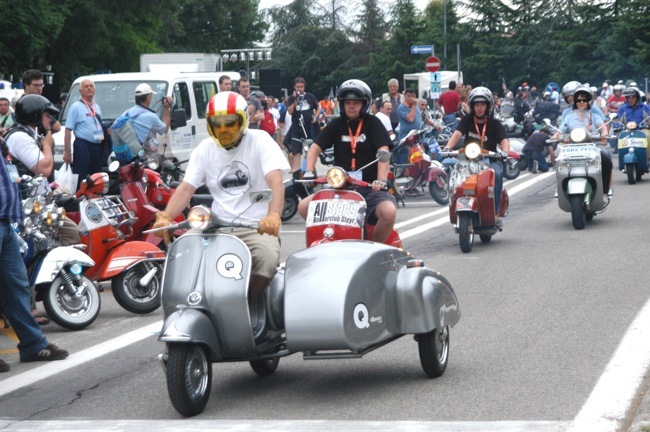 The Vespa World Days event traditionally represents the highest celebration of the timeless legend that is the Vespa. 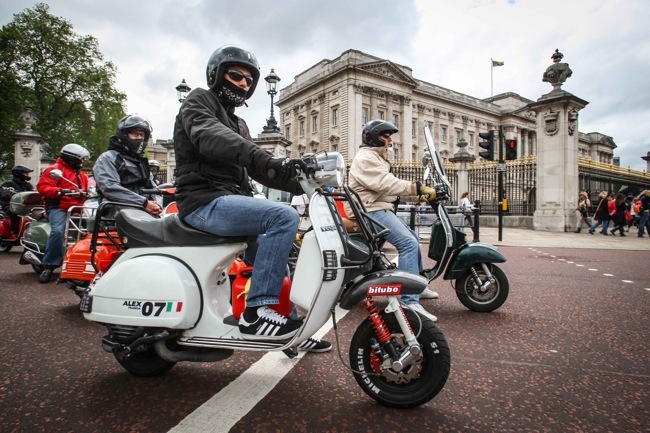 The 2015 edition comes 57 years after the first Eurovespa rally held in Belgium. In fact, the Vespa event, which was rechristened Vespa World Days in 2007, was organised for the occasion of the show in 1958, the Brussels World Fair. The love that fans have for Vespa was born immediately, so much that it drove many owners, even in 1946 when the very first Vespa was made, to share their passion; and so the first Vespa Clubs were established in Italy and abroad. 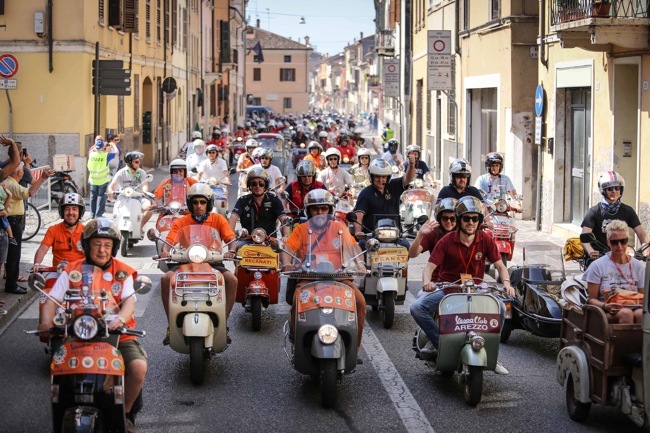 Today, there are 56 national Vespa Clubs associated with the Vespa World Club and more than 780 registered local Vespa Clubs, with over a total of 67,000 members worldwide. This past year, in Italy alone, more than 100 rallies for fans were held. Information on the Vespa World Days can be found at www.vespaworlddays2015.com and on the official social media sites such as facebook.com/vespa. They can be followed on twitter.com/vespa_official or with hashtag #vwd2015.